An assortment of adhesive from Glue Dots! YES YES YES – you will love all this fabulous adhesive. There is definitely something in here to help you keep your next project STUCK together! #2 – Ranger Tim Holtz Distress® Mini Archival Ink pads are waterproof, acid-free dye inks featuring the classic Distress color palette in the same fade resistant formula used in Ranger Archival Ink. Archival Inks are permanent on many surfaces, providing long-lasting detailed stamping results that won’t bleed when used with water-based inks, markers, acrylic paint, and watercolors. Ink pads can be easily re-inked with the coordinating Tim Holtz Distress® Archival Ink Re-inker. The small convenient 1.25” x 1.75” size pad make these inks ideal for various craft and mixed-media projects and can be stored in the Mini Archival Ink Storage Tin. #3 – Simple Stories The Spring Farmhouse collection by Simple Stories is designed with soft, warm colors, fun spring graphics like rainboots, bicycles, birds and flowers as well as springtime sentiments. This collection is HOT OFF THE PRESS! #4 – Stampers Anonymous Who doesn’t need a Tim Holtz for Stampers Anonymous SPLAT BOX?! Keep those messy sprays off your workspace and on your project. This prize package also consists of a beautiful Northwoods Rubber stamp, a mister and TWO examples of cards you can create with these Stampers Anonymous products. LOVE IT! #5 –Pink & Main These Sweet Bouquets stamps, sentiments and coordinating dies from Pink & Main have SPRINGTIME fun written all over them. Perfect for both cardmaking and scrapbooking. Wow! Thanks for the chance to win! Done! Done for Day two. Wow, such amazing products! Done, all sponsors today I’ve liked and followed from previous Creative Scrapbooker contests! Life without crafting is like taking a shower without water. And what a flood of fantastic prizes on this day #2. Thanks CS and all the wonderful sponsors! Great products. Thanks for this opportunity! Done!!! Love all the companieS!! DONE!!!!!! Thanks for doing this….this would be a dream to win!! Done ✅. Thanks to you and the sponsors. Done – already in love with all these partners ! Thanks for a great contest. Done! Love all these companies, especially pink and main!!! Done!! Thanks for the chance to win. Done and an interesting tour it was. Would love to be the winner of such beautiful products. Thank you to you and your sponsors for the wonderful opportunity. Would love to be the winner of such beautiful products. Thank you to you and your sponsors for the wonderful opportunity. Done….. Some old favorites and some new sites. Done. Another great selection of new products. have done day 2. thanks for the opportunity! Done!!!! Woohoo, another great day of sponsors! Such a great community. Done like dinner! Thanks so much for a great giveaway! Done! Thanks for sharing some awesome new goodies with us! Done. The products are awesome! What a great opportunity this is! Thank you! Done and thank you so much for this chance to win fabulous prizes. Done. So glad to have another entry. Thanks again for the opportunity to enter. Day 2 done. Wow! Even better! Day 2 done. Wow! Even better! Thank you. oh I adore these companies! Following their blogs. Done. Thank you for the contest. Some of these items I have seen and wanted to try but haven’t yet, would love to win. So many wonderful products…not enough time. Done. Thanks for offering these lovely prizes. Absolutely awesome winner package, probably the best one I’ve seen since I started scrapbooking. The more I look, the more I want to win. Done, thank you so much for the chance!! Such fun products, thanks to the sponsors! Done! Some of my favorite companies! Done! DONE! At last! Thank you for securing these incredible prizes! Done Thanks so much for a shot! done! This is so much fun! Done! Love learning about new companies. Done. I can not get over how many companies are represented in this give away. 🙂 day 2 done. Thank you for sharing!! Done, and thank you for sharing the lovely prizes! 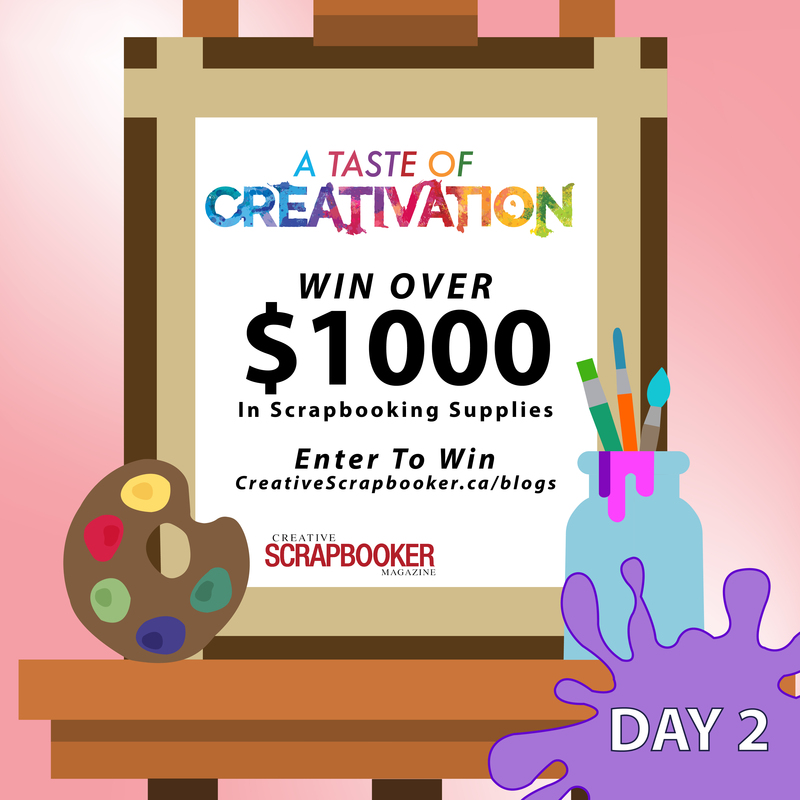 Day 2 – DONE 🙂 Creative Scrapbooker, you are all amazing! Love that you are doing this.